Orrery, by Thomas Wright, c. 1731 (Inv. 35757) It is thought that this orrery was owned by Charles Boyle. It is kept in the basement of the Museum, come see it when you next visit! Story: The importance of Charles Boyle, Fourth Earl of Orrery, in the history of science is perhaps most simply captured by his name and his title. His surname – Boyle – points to his relation to the esteemed seventeenth-century natural philosopher Robert Boyle, who is associated with the air pump. His title – Earl of Orrery – points to his own contributions to science and natural philosophy, which were so widely recognised that the orrery, an astronomical device used to model the solar system and pictured above, was named after him. Born to nobility in 1674, Charles Boyle was raised in a household that valued science and learning. He graduated from Christ Church, Oxford in 1694, before launching his career in the army and as a statesman. Until 1699 he served as a representative in the Irish Parliament and later became a M.P. for Huntingdon. 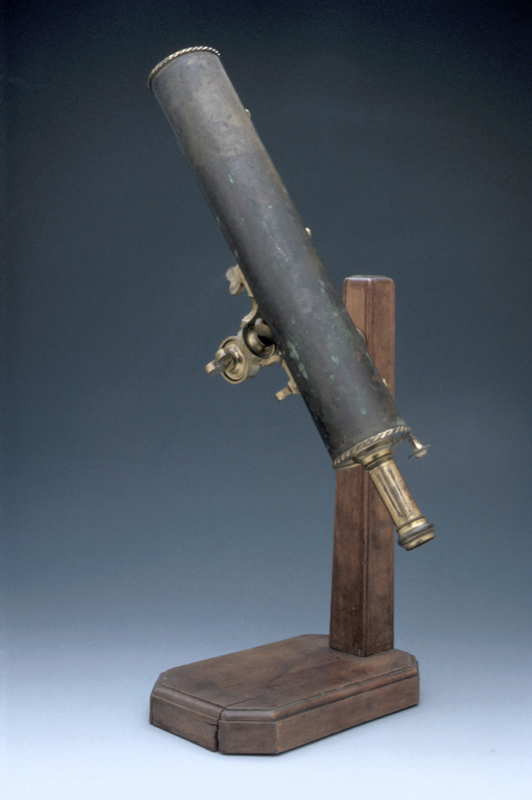 Gregorian Reflecting Telescope with Stand, c. 1710 (Inv. 20020). 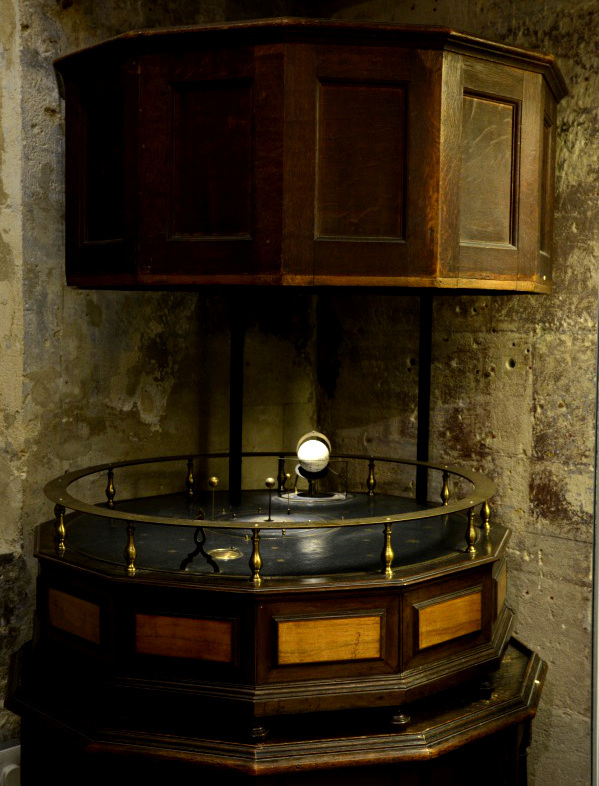 This object is one of many within the Orrery Collection at the Museum. Professionally, Boyle was firmly a statesman: he performed no seminal experiments, and he has no scientific discoveries to his name. What made Boyle an amateur scientist, therefore, had less to do with the things he did and more to do with the things he had – his collection of scientific instruments ranked among the finest in England. 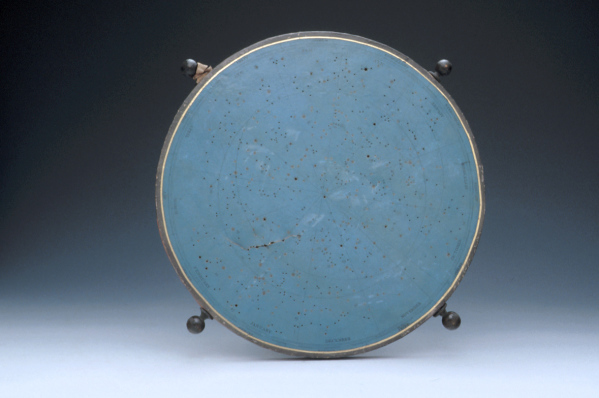 The collection included everything from glass specimens for use with a microscope to Gregorian reflecting telescopes, and Boyle, driven by a deep personal interest in the sciences, went great lengths in amassing and tending to the collection. As a result of his success as an amateur collector, Boyle was named a Fellow of the Royal Society in 1706. Along with science, Boyle also pursued writing and even published a play called As You Find It. During his eventful life Boyle was, for a short time, imprisoned in the Tower of London in 1722 as he was suspected of treason and being apart of the Jacobite Atterbury Plot. However, no evidence was found and he was released on bail before being discharged. Boyle is highly representative of scientific amateurs of his time, most of whom came from backgrounds of wealth and nobility, only dabbling in science and natural philosophy of out of personal interest. Even among amateurs, scientific activities during this time were predominantly confined to those with ample time and resources at their disposal. Boyle serves as a good starting point for understanding how the status of the amateur scientist became available to wider segments of the population over the following centuries. Story: In 1963 Jack made a Newtonian reflecting telescope, with a primary mirror 32 cm in diameter and having a focal length of 203 cm. Despite its poor location in the suburbs of London, some very useful observations were made with it. Two examples are given here. Pencil drawing of Jupiter by Jack. 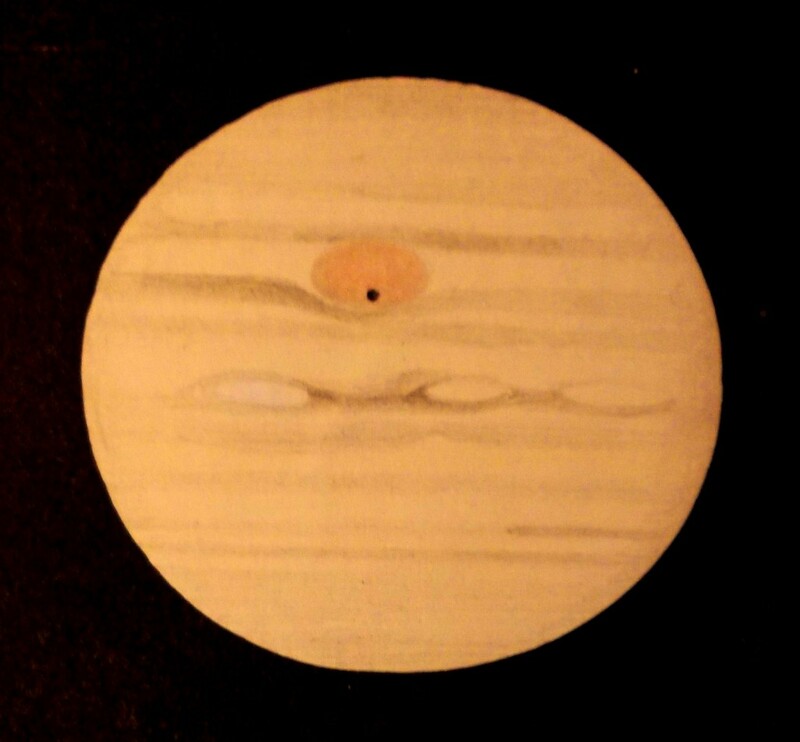 Above is a pencil drawing of Jupiter made by Jack on 20 March 1966. The planet is a gas giant that rotates on its axis in just less than ten hours. This causes it to be flattened at the poles and means that drawings have to be made quickly. The Great Red Spot seen in the image is a vast storm that was first identified in 1665 – it is comparable in size with the Earth! The black dot, that just happens to be seen here inside the Red Spot, is the shadow of one of Jupiter’s moons, Europa, which was discovered by Galileo. Along with every drawing, Jack made detailed notes about the position of each atmospheric feature seen on the planet’s disc. The observation, made by Jack (on 14 November 1969, between 21:25 and 22:26 Universal Time), took place less than an hour after these happenings, and is reconstructed in the sketch below, which is based on his extensive notes. Sketch of Jack’s observations of Apollo 12 on route to the moon, reconstructed from his notes. O2 is a cloud of liquid oxygen, released in the course of the manoeuvre. R is the Saturn-V rocket final-stage, which had finished its task. M is the Apollo spacecraft, now including the Lunar Module: it was amazing to think that it contained three astronauts already en route to the Moon. 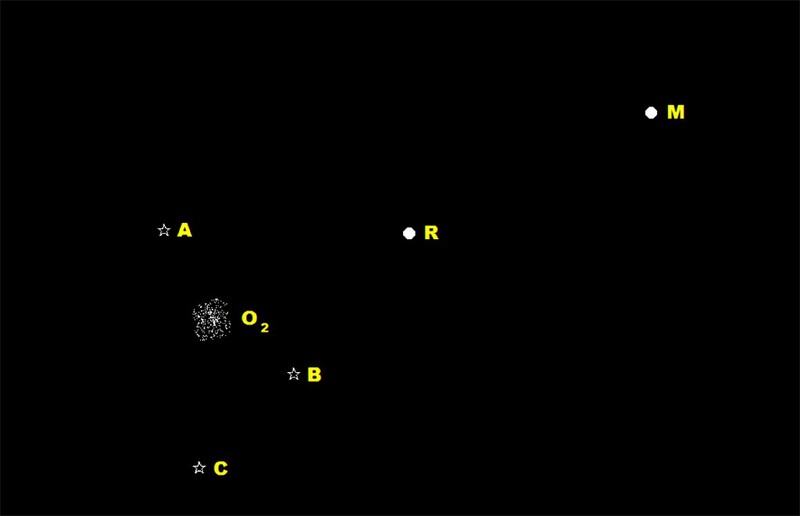 R and M were just points of light, and all of the items in the sketch moved together rapidly in relation to the fixed stars. A, B and C were lights that flashed irregularly about once every 5 to 10 seconds. At first Jack was puzzled about this, but he then realised that these were three out of the four covers that had protected the Lunar Module. Jack also build a model observatory, complete with a motorised framework, which you can read about here. Special thanks to Peter at the Museum of the History of Science for providing this amazing story and the images which accompany it. 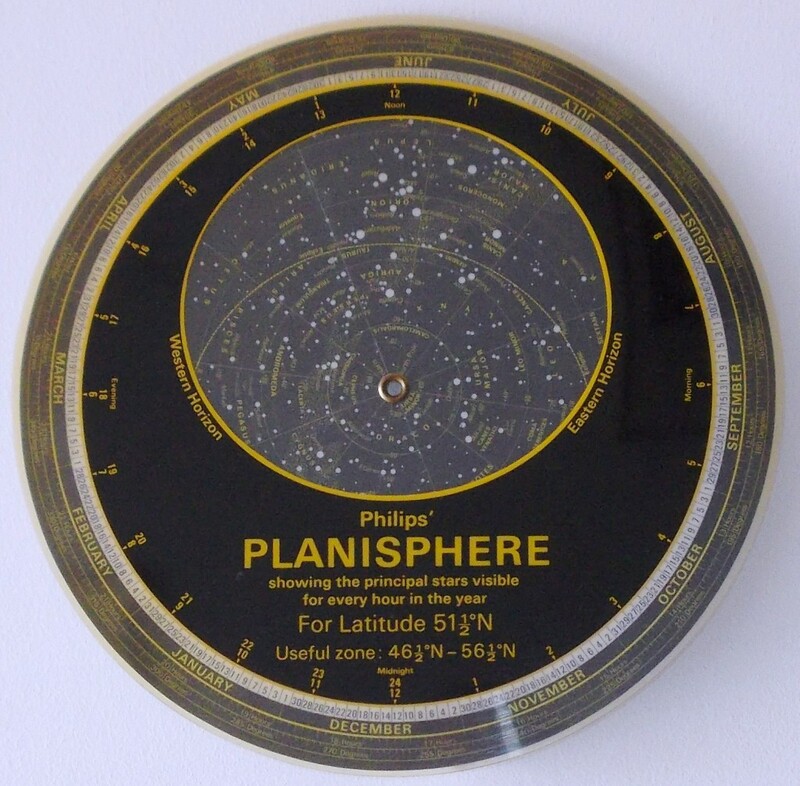 This is the planisphere Peter uses, it looks very different to the Museum’s one at the bottom of the post! The big dipper can be seen to the right of the pole star. Story: My modern planisphere is shown in the photo above. The brass rivet at its centre marks the position of the pole star. Because the Earth rotates daily, all stars seem to revolve about the pole star. By setting the date and time a planisphere shows which stars are visible in the night sky. Face north (in the direction of the pole star). Hold the planisphere vertically in front of you with the oval sky-opening towards the top. Keeping the front disk of the planisphere fixed, rotate the star disk until the orientation of the big dipper (plough) on the star disk matches that of the big dipper in the sky. Celestial Planisphere, London, Early 19th Century (Inv. 40743). This planisphere from the Museum’s collections is about 200 years old! 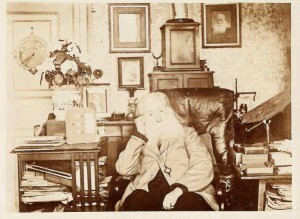 Print (Collotype, from a Photograph) of Washington Teasdale at his Desk, c.1897 (Inv. 35156) This is probably a self-portrait of Teasdale. Story: The photograph above was chosen as the main exhibition image because it was taken by an amateur scientist and photographer, Washington Teasdale (1830-1903). Washington Teasdale was an engineer by profession, but in his spare time his interests ranged greatly through many areas of the sciences. In this respect he was very much a typical Victorian amateur scientist, because he did not like to focus on one single science, but all of them. Victorian scientific amateurs can also be called gentlemen scientists. These were men of means who had the time and the money to invest into their hobbies. The materials and instruments needed were expensive and it would require extensive free time to set up and perform experiments. The sciences they dabbled in included astronomy, geology, geometry, microscopy, mechanics, meteorology, and photography. In addition to photography being one of his hobbies, Teasdale used it to capture and represent his scientific interests. 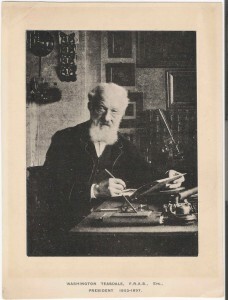 Photograph (Gelatine Print) of Henry Perigal in his Study, by Washington Teasdale and George Smith, April 4, 1897 (Inv. 76721). Henry Perigal was a British stockbroker and amateur mathematician, and a friend of Teasdale. 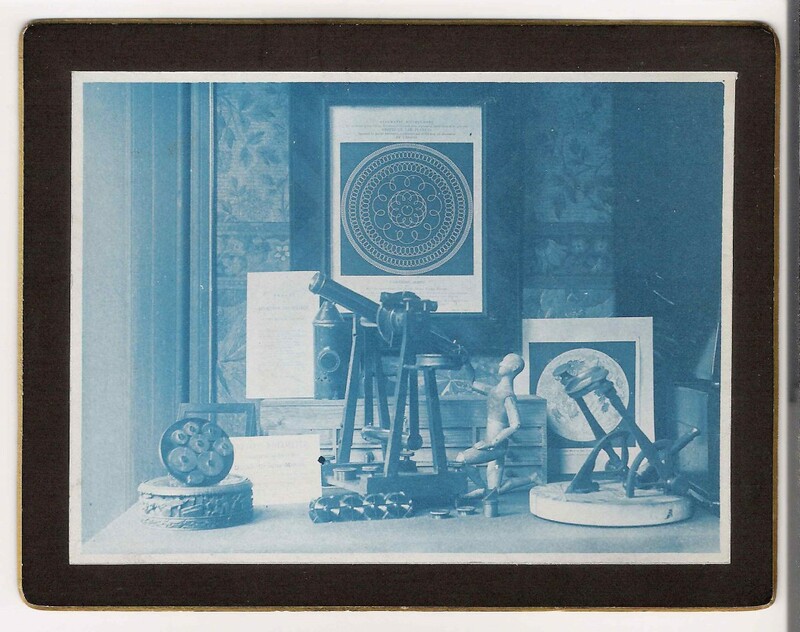 In our chosen photograph he has arranged a number of astronomical instruments – which he may have used personally – as a way to display his interest in astronomy and the orbital motion. Teasdale also took a photograph of a similar representation using a tableau for biology and microscopy, and we will be displaying it in the exhibition. Cyanotype photographs are blue because they are made by being exposed to different chemicals and light at an earlier point in the developing process. Teasdale used this process to produce many photographs, but he also took gelatine print photographs, often of portraits of scientists who he met whilst a Fellow of the Royal Astronomical Society. Teasdale was from Leeds, and so the majority of his photographs were taken there. He even helped re-establish the Leeds Astronomical Society. He liked to portray himself as a modest amateur, and not one destined for great things or professional status. Even though he saw himself as modest, he frequently made trips to London to visit friends who were amateur scientists and to attend meetings of various scientific and non-scientific societies which had become a staple in Victorian Britain. If you would like to learn more about Washington Teasdale you can visit the narrative on the website here, or visit the display of a number of objects from his collection in the entrance gallery of the Museum of the History of Science. We have named the small mannequin in the cyanotype photograph which is being used as our main exhibition photograph as Dale, after Teasdale, and hope to take him on a range of adventures investigating our love of everyday science. Look out for future blog posts on this!